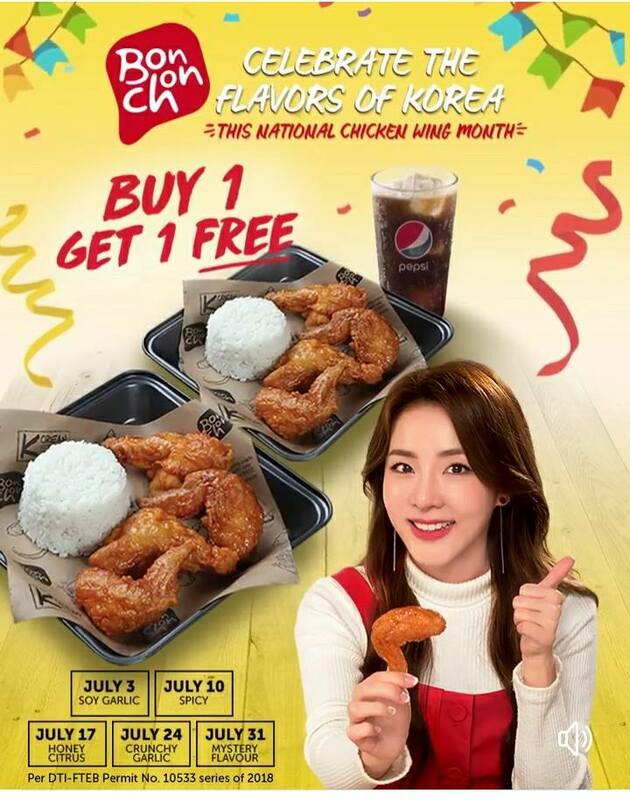 Bonchon celebrates the National Chicken Wing Month with the flavors of Korea all Tuesdays Promo of July! With a different GLAZE OF THE DAY every Tuesday, enjoy Bonchon's 2-pc K-Style Wings Boxed Meal and GET A FREE (Free meal is exclusive of drink) 2-pc Wings with rice ala carte! 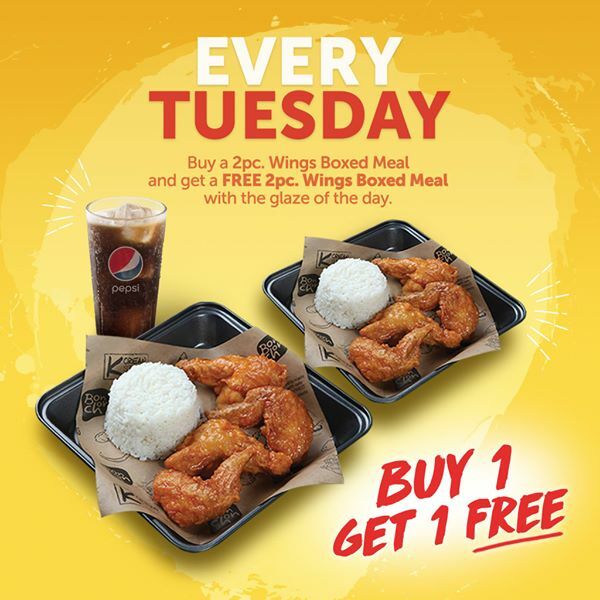 Get a FREE 2-pc Wings with Rice When You Buy 2-pc Wings Boxed Meal! *Promo is available in Bonchon Luzon branches only EXCEPT SM TUGUEGARAO, ROBINSONS TACLOBAN, AYALA LEGAZPI, ROBINSONS NAGA, SM CAUAYAN, SATY NUEVA VISCAYA, SM LEMERY, MATALINO, ROBINSONS MALABON, VICTORY MALL CALOOCAN, SUNSTAR, SM TELEBASTAGAN and SM DASMA CAVITE. Promo NOT VALID for VISAYAS and MINDANAO branches except for ROBINSONS BUTUAN. *Note: For stores NOT serving Pepsi products, such as, CHERRY CONGRESSIONAL, WALTERMART MUÑOZ, ROCKWELL, LANDMARK MAKATI, LANDMARK ALABANG, LANDMARK TRINOMA, GATEWAY, Iced tea will be served. → Get a FREE 2pc Wings with Rice when you buy 2pc Wings Boxed Meal. 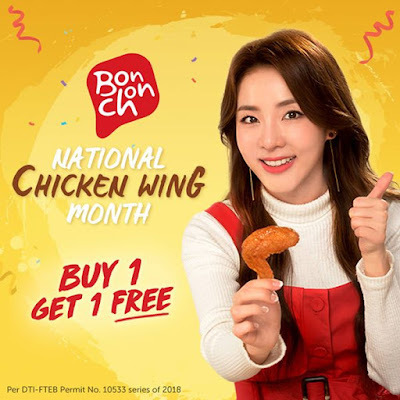 → Promo is exclusive to chicken wings only. → You may choose the glaze for your 2pc chicken meal. However, the free 2pc wings with rice is exclusive to the flavour of the day (Refer to schedule above). → Free 2-pc wings with rice promo is EXCLUSIVE (does not include) of drink. You may order additional beverage as ala carte, instead. → Maximum of 5 orders per person is allowed. This means 5 orders of regular boxed meal and 5 orders of the free 2pc wings with rice. If you wish to order more, you can line up again. → Promo is available for dine-in and take out only, and NOT available for delivery orders. → Promo is only available on all Tuesdays of JULY. → Promo is not valid in conjunction with other promos and discounts. → PWD/pregnant women/senior citizens will be given priority when lining up.